Welcome to Portland! It's the second stop in the Year of Puzzles, our year-long puzzlehunt filled with great puzzles by world-class authors. In honor of the City of Roses, the puzzle is a Rows Garden, a fun puzzle of interlocking Rows and Blooms invented by Patrick Berry, who crafted this one. 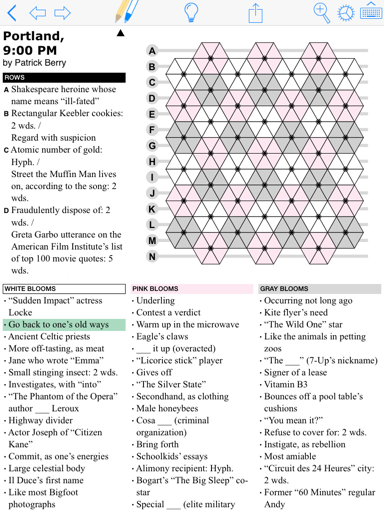 The story of the Year of Puzzles, written by Emily Dietrich continues as well. Don't expect to learn too much about the mysterious figures behind your journey just yet, though all will be revealed in time. The Rows Garden highlights some features unique to the Puzzazz app. Not only is Puzzazz the only app that lets you solve unusual puzzles like the Rows Garden and the previous double spiral puzzle, but unique features like clue notes and cell marking, and, of course, TouchWrite™ handwriting recognition, make solving them as fun as they are on paper.